Annapolis is a pet-friendly town for sure. It seems like folks take their fur-babies with them everywhere they go. And, while we all love spending time around town with our canine companions, it is super important to proceed with caution on hot summer days. Being overeager in high temps could spell danger for your pup. That is why we are sharing The ASPCA guidelines for keeping your pooch safe during the dog days of summer. Schedule a spring or early summer vet check-up. Make sure Fido is up to date on all vaccines. Talk to your vet about heartworm plus flea and tick prevention medications. Our pets can get dehydrated much quicker than we do. Offer your pet plenty of fresh, clean water, and often. There are conveniently collapsible and inexpensive bowls on the market you can carry in your purse or backpack. Proved a shady place in which your pet can retreat to. Avoid extended periods in the direct sun. Believe it or not, your dog can suffer from sunburn just like you do! Be careful to not over-exercise your dog, even if they want to keep playing. Insist they take frequent breaks, especially if you are walking long distances. Consider taking a periodic break inside an air conditioning space. Did you know that animals with flat faces like pugs, Pekingese, and bulldogs are more susceptible to heat stroke? They are unable to pant efficiently, therefore overheat faster. These pets, along with the elderly, overweight and those with breathing conditions should stay indoors in the air-conditioning as much as possible. Never leave your pet unsupervised around a pool. When introducing your dog to water, do so gradually. Consider having them don doggie PFDs when on a boat. Rinse them off after swimming so that the chlorine or saltwater does not irritate their skin. Don’t let them drink pool water as it contains chemicals that may not agree with them. If your dog has really long hair, you may want to consider a trim for the warmer months. Remember, though, that your dog is susceptible to sunburn, too. So, don’t shave them completely, which ironically can contribute to overheating. In scorching temps do not allow your pooch to linger or lay on hot asphalt. The blacktop emits a tremendous amount of heat. Being close to the ground will quickly increase your dog’s body. Furthermore hot sidewalks and asphalt can cause severe burns to the pads of your dog’s paws. Everyone wants a beautiful lawn and bug-free backyard. However, commonly used insecticides and lawn fertilizers could be hazardous if ingested. Keep citronella candles, tiki torches and other bus sprays out of reach. Always store chemicals safely. If you suspect your pet has eaten a poisonous substance call your vet immediately. Or, call the ASPCA Animal Poison Control Center at (888) 426-4435. Foods and drinks commonly found at backyard cookouts can be hazardous to pets. Keep alcoholic beverages out of reach. Certain snacks you enjoy could be poisonous to your doggies, such as raisins, chocolate, grapes, and onions. Furthermore, while it might seem fun to offer your pet sweets or other foods, any change in diet could cause major digestive issues. Never, ever leave your animal alone in a parked, locked, sealed vehicle. Even if you “crack the windows,” the temperatures inside can reach a deadly point very quickly. Consequently, locking your pet in your car is illegal in Maryland, and observers have the right to call the authorities. The ASPCA recommends leaving your pet home during Fourth of July Fireworks. Many pets are fearful of the loud noises and may react by taking off and getting lost. Plus, exposure to fireworks can result in severe burns and emotional trauma. Prepare a quiet, sheltered escape-proof are in your home, so your dog feels secure and safe. Naval Bagels loves your dog as much as you do! We implore you to follow these tips to keep your pet safe during the dog days of summer. Stop in and dine at our pet-friendly patio. 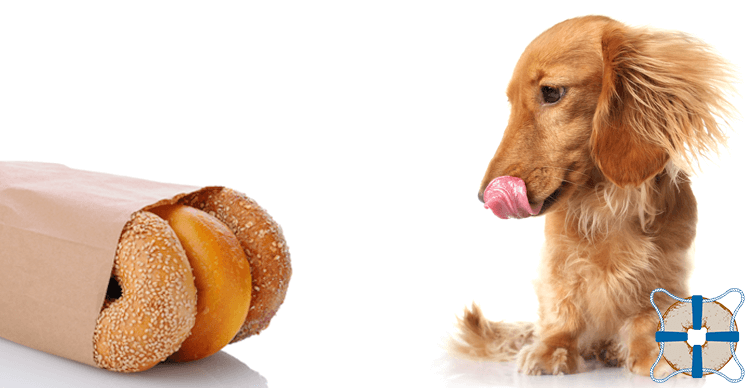 You can munch on your favorite bagel sandwich, and Fido can enjoy a doggie bagel. And, we always offer bowls of fresh chilled water! August is National Sandwich Month...Let's Celebrate!